A new study published in the American Journal of Preventive Medicine shows that the 1989 Canada–US Free Trade Agreement (CUSFTA) was associated with an increase in caloric availability of approximately 170 kilocalories per person per day in Canada. These findings suggest that the rise in caloric intake and obesity in Canada since the early 1990s can be partially attributed to its close trade and investment arrangements with the US. The escalating global prevalence of overweight and obesity, or “globesity,” is often described as a pandemic. Globalization via free trade agreements (FTAs) is often implicated in this pandemic because of its role in spreading high-calorie diets rich in salt, sugar, and fat through the reduction of trade barriers like tariffs in the food and beverage sector. Investigators used a “natural experiment” design (that mimics a randomized controlled trial as closely as possible) and data from the United Nations Food and Agricultural Office to evaluate the impact of CUSFTA on caloric availability in Canada. They found that it was associated with an increase in caloric availability and likely intake of approximately 170 kilocalories per person per day in Canada. Since 1994, the rise in calorie availability in Canada far exceeded other countries. 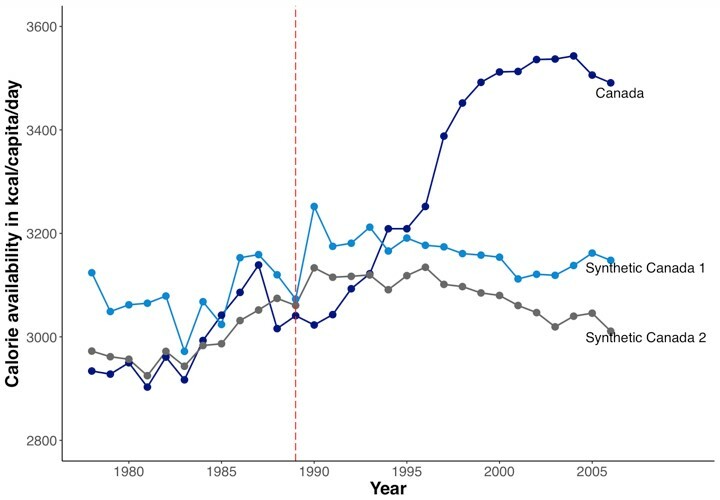 Trends in calorie availability in Canada and synthetic controls, 1978-2006. Data from the United Nations Food and Agricultural Office (2016). “Synthetic controls” are constructed from a weighted combination of OECD countries, where weights correspond to the similarity of each country with Canada before CUSFTA. US FTAs are especially likely to encourage elevated caloric intake because of the highly competitive processed food and caloric beverage industry and associated ‘obesogenic’ environment that pertains to the US. Processed food and caloric beverages play an important role in increasing caloric intake, as they are often calorie dense, leading people to unknowingly consume too many calories, and highly palatable, encouraging further consumption. This study has important implications for policy. It strengthens the quality of evidence that is used to highlight the potentially detrimental impacts of US FTAs on diets and shows empirically how trade policy is a structural driver of dietary behaviors. By doing so, it also highlights the need for greater coherence between nutrition and trade policy-making if governments wish to minimize the potentially deleterious impacts of FTAs on population health – and maximize their health benefits – without jeopardizing obesity prevention. The article is “The Impact of U.S. Free Trade Agreements on Calorie Availability and Obesity: A Natural Experiment in Canada,” by Pepita Barlow, MSc, Martin McKee, MD, DSc, David Stuckler, MPH, PhD (https://doi.org/10.1016/j.amepre.2018.02.010). It appears in advance of the American Journal of Preventive Medicine, volume 54, issue 5 (May 2018) published by Elsevier. Full text of this article openly available at www.sciencedirect.com/science/article/pii/S074937971831554X or to credentialed journalists upon request; contact Jillian B. Morgan at +1 734 936 1590 or ajpmmedia@elsevier.com. Journalists who wish to interview the authors should contact Pepita Barlow at pepita.barlow@nuffield.ox.ac.uk. This research was funded by the Wellcome Trust and European Research Council Grant 313590.